Living… in Philadelphia. Topanga is tied to her hometown to the point where even her family can’t take her away from it. Topanga’s entire life is almost uprooted when her mother’s job is transferred to Pittsburgh — over 300 miles away. Topanga is devastated, eventually running away from home and asking if she can live with Aunt Prudence back in Philadelphia until graduation. Profession… high school student. 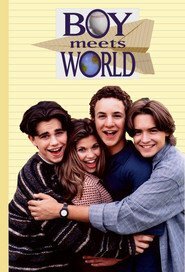 Topanga is by far the most successful student out of her group of friends, but not by accident. She tries the hardest and cares the most. She has a tendency to get competitive and loves the attention success brings. While she started high school as the weird hippie girl, she soon transitioned into something of an “it girl,” although her friends are far too dorky to ever make her feel comfortable with that distinction. Interests... crafts. Topanga loves to bake and plan parties, to the point of alienating others with her enthusiasm. When she spent the holidays at the Matthews house, she basically took charge of the festivities, insisting on her own traditions with very little room for compromise. This made Cory doubt their long-term viability. She drinks cider, not eggnog, and prefers a fresh-cut tree to an aluminum one — how could they ever work? Relationship Status... in a relationship with Cory, seemingly forever. The only other boy Topanga has ever dated was Ricky Ferris, an old friend from grade school. She did it as a lark while she and Cory were on a break. Topanga and Cory have made it through so many fights and hard times together; they both know they’re in it for the long run. Challenge… getting past her doubts and insecurities about the future. Topanga is torn about what she’s going to do after high school. She doesn’t share Cory’s idealism that nothing could tear them apart. Her own parents’ divorce seriously damaged her faith in love and increased her insecurities. She's torn between going to Yale and going to Pennbrook with Cory and their friends. Her future can either be a continuation of her past relationships or a completely fresh start – something she’s not particularly excited about. Personality… mature, driven, and confident. Topanga often finds herself acting as the voice of reason. She alternates between comforting the boys and putting them in their place. She is goal-oriented with a forward-looking view of life, but she’s not afraid to get goofy once in a while. As she puts it, “I’m a damsel, but not the distressed kind – one who’s very together and in complete control of her own destiny.” Topanga attacks every problem with the enthusiasm of being a know-it-all. That’s not an insult. She’s just very driven to do the right thing, and that’s a good thing. Topanga Lawrence's popularity ranking on CharacTour is #1283 out of 5,000+ characters. See our top-ranked characters and read their profiles.